This one goes out to all the Starbucks haters. 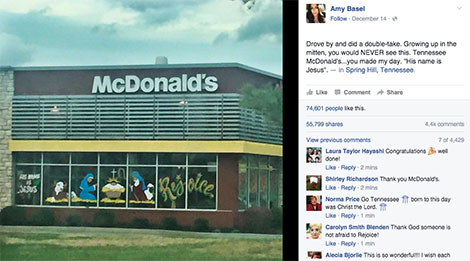 When Tennessee resident Amy Basel drove past her nearby McDonald’s location, she was taken aback by the display she saw on the restaurant’s window: a full-on nativity scene. Basel explains in a Facebook post that she couldn’t believe her eyes. It isn’t every day that you see a nativity scene on your local McDonald’s. With nearly 56,000 Facebook shares and almost 75,000 likes, the post has clearly struck a nerve. Thousands of people commented on Basel’s photo to show their support for the franchise’s display of faith.